At this time last year, I was trying to figure out if I should be running a marathon the next day or not. Ultimately I decided that no, I shouldn’t do it because of all my injuries, but that I was going to do it anyway. It went surprisingly well for 21 miles, after which it was pretty miserable, but that was more expected. And, “at least I finished!!! !”, which is the consolation phrase we all like to say when people run really slow marathons. This year I once again waited until today, the day before the race, to decide how much, if any, of the Portland Marathon I will be running. Only this year my options are slightly limited, as I am not registered and so will not be allowed to cross the St. John’s bridge. And I have not even kind of trained for a marathon in any way, shape, or form. This year, I will be running to support/yell at one of my own, my sister, Erica! 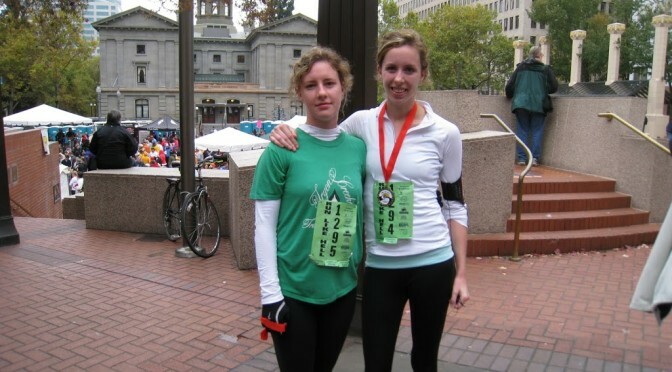 Here’s a picture of us after we ran the Run Like Hell half marathon, two years ago. Hopefully after running a marathon she’ll look at least twice as happy as she does in this picture. I thought it would be good to run the last 5 or 6 miles with her, so I was thinking we should meet around mile 15. A look at the course map showed me that runners will cross the St. John’s bridge at mile 17, so it would be better to meet Erica at mile 18. I called her to discuss this plan, and we decided that I would wait for her at mile 18 starting at 9:45. As soon as I hung up I realized that I had been doing math at the level of a 5 year-old, and that meeting at mile 18 would mean running 8 miles, not 5 or 6. Erica probably realized this and didn’t say anything because she wants me to run with her for longer. I’m on to you, Erica. I could probably use a long-ish run though, so I’ll stick with this plan. It doesn’t matter how out of shape I am, an 8 mile run for me will still be easier than a 26 mile run with most of the people I’ll be running near. I should end this post before people realize how self-centered I can be about a race that I’m not even running. Is anyone else doing the marathon tomorrow? If you are, and if you run at a pace relatively close to my sister’s, I will try to say hello and good job tomorrow if I see you, even if you’re not doing a very good job. But I hope you are doing a good job, because it’s very embarrassing to run a marathon and not even do a good job. 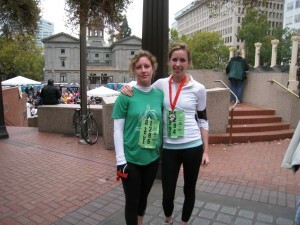 Good luck 2011 Portland Marathon attempters! See you on the course!